There is always competition for the consulting engagement you’re hoping to land, even if that competition is only internal staff. Our profession is becoming increasingly crowded, though, and competition from other firms is on the rise. 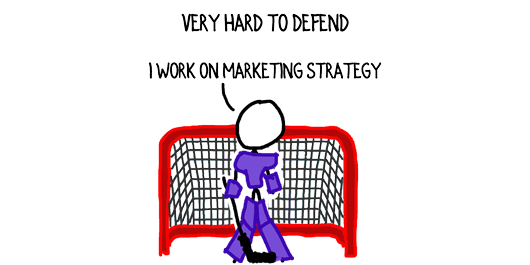 Do you know how to defend against other consultants gunning for your business? The difference was our goalie, who played insanely well. It was his defense, not our offense that kept us in the game. In consulting, the ultimate defense against competitive consultants taking a run at the project you want is your powerful, trusted-advisor relationship with the decision maker. However, relationships aren’t the only defense. Even a strong relationship can be displaced by a well-aimed shot from a hungry competitor—something I’ve learned the hard way on occasion. 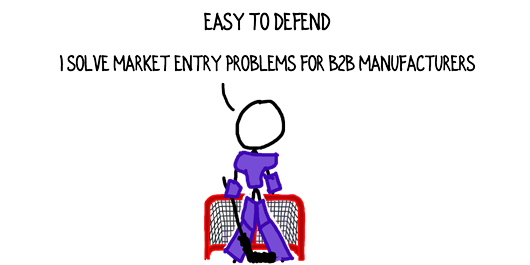 That’s why you also need to defend your business like a goalie. Shrink Your Net. If a goalie had to prevent pucks from hitting any part of the 85-foot wide wall behind him, he’d make few saves. (And I’d score more than twice a season). But a hockey net is only six feet wide, and that’s a heck of a lot easier to defend. Goalies can’t shrink the territory they’re required to guard, but you can. Define your target narrowly. Focus your consulting firm on a highly-specific problem and a tightly-bounded market. Improve Your Skills. Our goalie was a phenomenally talented young man. While other hockey players his age participated in skating drills and practiced passing plays, he devoted his high school and college years to honing his netminding wizardry. You could easily become distracted by the various challenges your clients face and the never-ending small fires associated with running a consulting practice. Don’t. Obsessively build your skills, while offloading distracting tasks that could swallow your time. As an independent consultant running a solo practice or boutique firm, the two skillsets you must invest in and constantly improve are winning business and solving the specific, narrow problem that your firm addresses. 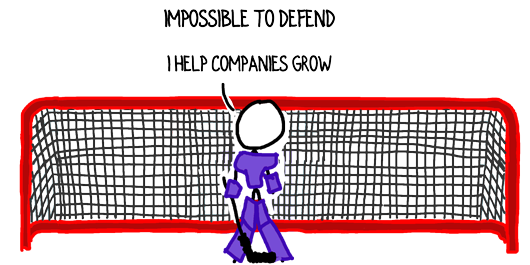 Recently, I assessed a consulting firm that epitomizes the goalie defense. They’ve shrunk their net down to a super precise, extremely defensible target: problematic relationships between CEOs and Boards at companies owned by Private Equity. Plus, they continuously develop incredible depth in their solutions to those problems—outfitting Private Equity firms and the CEOs of their portfolio companies with every definition, process and template necessary to transform a struggling relationship into a productive partnership. As a result, even when they haven’t cultivated the strongest relationships with their clients and prospects, they’ve consistently knocked other consulting companies out of the box and survived attacks from talented competitors. Their goalie defense is unassailable and it’s winning them a ton of business. If you were going to choose one way to improve your skills or shrink your net, what would it be? David I’m reading your book and like it very much. A lot of good advice. I have a question tough. We recently, within the last 6 months, formed a consulting alliance. A group of professionals with different backgrounds and skills in order to cover the breadth of challenges our customers might face. Are approach so far has been to get clients to discuss their issues with us and then based on their specific need at the time present the person on our team with that expertise. Until we can figure out the greatest unmet need among our targets, so that we can narrow our focus, what do you think about this approach? Congratulations on the formation of your consulting alliance, Cliff, and thank you for the kind words about my new book. Re my thoughts on your model, I’m afraid you won’t like my answer. From the consultant’s side of the desk, a formal or informal alliance of non-competing consulting firms appears like a win–you share leads and everyone is exposed to more opportunities. From the client’s side, though, it’s generally a disservice. Let’s say one of your partners in the alliance specializes in naming products. A prospect approaches you with a potential naming project and mentions he’s also considering NameFlash. You look into NameFlash and realize they actually have a better solution than your partner. What do you do? Your financial incentive is not aligned with the client’s best interests. That’s one reason I formed my Ascendant Consortium (the corporate side of my business). It delivers the benefits of a one-stop-shop (plus some other benefits) but I explicitly don’t have allegiance to any particular consultant. My consultants know this–if I find someone better than them, they’re out. Alliances split your obligations. Think Right-Side Up: focus on what’s best for the client and, in the long run, that will pay out for you too. David, this article reminded me of the Problemeter exercise in your book. The one skill I would choose to work on first is identifying the specific narrow problem. My market is: Owners, CEO’s and Board Members of mid-size companies. I help them solve two problems. 1) Turnaround underperforming business units, functions, or workgroups that are missing their targets, so they can hit their numbers faster. They are struggling to get the results they need from their people. This one solves an immediate obstacle to growth. It sometimes results in my role being that of a “general contractor” and bringing in the right solution, if that is what they need to succeed. Equally important is addressing future growth goals (2-3 yrs out). Those can be at risk because they’ve outgrown the workforce they have today. The workforce they need in 3 years won’t magically appear overnight. I help them to figure out a gameplan/strategy so their people are ready and they gain competitive edge. This is more the aspirational. How do I roll this up into one problem? It seems like two. Both are tied to growth, but that as you mention above is too broad? What a great case study you’re providing, Debbie. Thank you for being open with your next steps. The answer to, “How do I roll this up into one problem?” is: you don’t. Pick one. You’re definitely much too broad in your target definition and the problem you solve. “Turn around under performing units” is almost as general as “help companies grow.” What you’re doing is terrific; however, it’s also impeding your ability to attract clients and defend against competitors. Winning projects or leads in the toughest time of competition seems difficult but having a particular set of skills required can increase the chance of winning. Nice share I found this informative and of value. Thank you for sharing. As you said, Alex, a strong skill set increases your odds against competition. Knowing you have “the right stuff” also may increase your confidence, which is a huge plus when competing for consulting projects. Thanks for chiming in on this article. 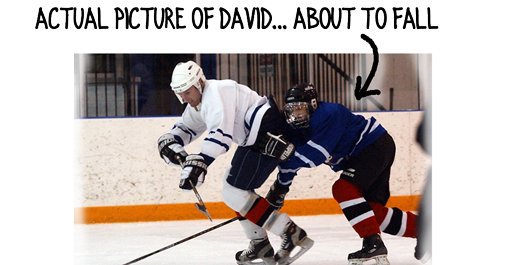 Hi David – Love this article and the points you make. I lead a consulting and training firm – we focus on helping organizations raise the bar on talent (more effective recruiters and hiring managers) and improve speed and experience (better, faster recruiting process). One of the additional benefits of shrinking the net is that you can generate better referrals. You can “teach” your colleagues, clients and non-competitive consultants what 1, 2 or 3 specifical problems you solve, and then when they hear those problems, they think of you. Referrals go up (quantity and quality) when you’re very specific, go down when you’re generally solving people/leadership/growth problems. Our firm’s description is generally: We don’t recruit. We help companies recruit better. And then we list out the 2-3 ways we do that – recruiter training, interviewer/hiring manager training, and improving speed and quality through better recruiting strategies/processes. Our narrative then attaches to our buyers’ goals – raising the hiring bar, transforming their teams to be more advisors (vs transactional), and accelerating time to fill. When I first started, it was tempting to try to be everything to everyone. But this refined focus has been one of the keys to our growth. Thank you for putting out great content like this. Very nice illustration of shrinking your net, John. Also, you bring up an excellent point that I didn’t highlight in this article: when your focus is super-specific, it’s much easier for the folks in your network to spot opportunities and, importantly, to remember to recommend you. Thanks for bringing up that insight.